The Michigan Department of Transportation (MDOT) is responsible for managing the more than 32,000 lane miles that make up the statewide transportation system, which requires constantly evaluating them for any potential safety and congestion issues. Recently, MDOT's planning and design teams turned their sights on the US-23 corridor, where motorists routinely experience traffic slowdowns during morning and afternoon peak travel periods. But this time, adding an extra lane was not a foregone conclusion. Instead, MDOT investigated successful active traffic management systems already in use in other states to solve its congestion and safety concerns. This ultimately resulted in the decision to install Michigan’s first Flex Route. "On US-23, we basically have a three-hour traffic slowdown during the morning rush hour and again during the afternoon rush hour," said Mark Sweeney, P.E., MDOT Brighton Transportation Service Center (TSC) manager. "We needed to find an alternative traffic management system that could solve our part-time congestion issues without adding a permanent third lane." Since our state is continuously challenged to do more with less funding, adding another lane, with its associated infrastructure impacts, property acquisitions and environmental issues, would be too costly. Instead, MDOT looked at how other states were using active traffic management systems to manage traffic congestion, and they found that a Flex Route could address operational efficiencies and squeeze more capacity out of the existing infrastructure at a much lower cost. Overhead signs advise southbound motorists which lanes are open to traffic. As a lane control system, a Flex Route uses overhead digital signs, cameras and electronic message boards mounted on large gantries. The digital signs manage traffic by opening and closing shoulder lanes, while the electronic message boards promote safety by warning drivers about any delays or incidents ahead. As a technology platform, it can be adjusted to address the evolving landscape, employing new customized programs to meet future needs, such as autonomous and connected vehicles that will be able to communicate roadway conditions. Although a Flex Route makes use of the existing infrastructure, it still requires the widening of bridges and shoulders to accommodate the gantries and the flexible shoulder lanes. The wider shoulders will promote effective incident management by providing several crash investigation sites along the corridor for emergency vehicles and motorists needing assistance. Flex Route 23 is scheduled to be completed by the end of 2017. Critical data will be collected throughout the initial operation of the Flex Route in order to optimize its efficiency, evaluate the system's effectiveness, and see how motorists react to it. If you would like an MDOT presentation about driving the Flex Route, contact the Brighton TSC at 810-227-4681. For more information about related traffic detours, lane closures and lane shifts, go to www.flexroute23.com or connect with MDOT through social media at www.facebook.com/michigandot and www.twitter.com/mdot_a2, search using #flexroute. US-23 Median: April. Construction work on Flex Route lanes from North Territorial Road to Barker Road, and from 8 Mile Road to the project end point. 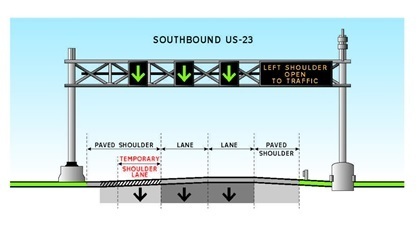 US-23: Tentatively scheduled after April 15. Begin work to stabilize the exposed earth areas. Gantry foundation installation work will continue along northbound US-23. Concrete patching work from 8 Mile Road north to the project end point. A Stopped Traffic Advisory System also will be installed. 8 Mile Road: Tentatively scheduled to begin in April. Construction work on roundabouts, northbound off ramp, southbound off ramp, and bridge approaches will take place. A new bridge deck will be poured. Barker Road/Railroad Bridge: Tentatively scheduled to begin in mid-April. Construction work on both bridge decks is planned. Tentatively scheduled in early May, temporary widening between the two structures planned to accommodate the two southbound lanes. North Territorial Road: Tentatively scheduled to begin in late April. Beams will be placed on new bridge abutments. 5 Mile Road: Tentatively scheduled to begin in early April. The car pool lot will be removed. Construction work on 5 Mile Road will be done in preparation for opening the road to northbound traffic in early May. Joy Road: Work is expected to continue through April. Repair work will be done on bridge structure. 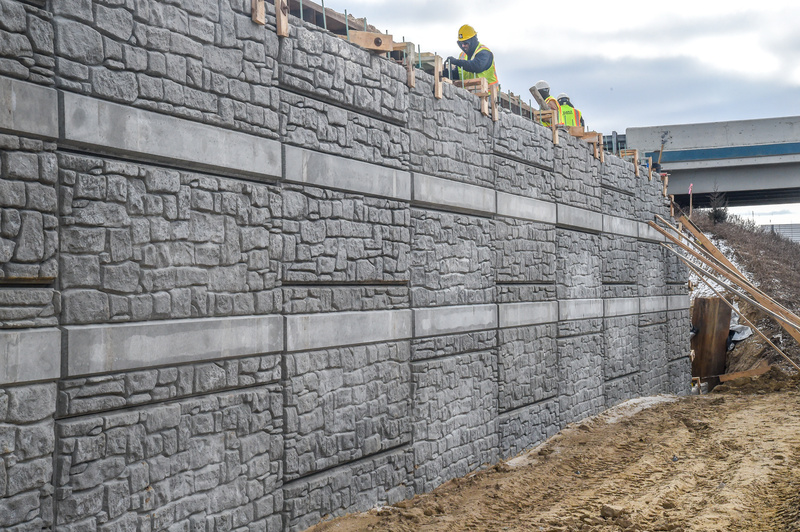 Construction workers are busy completing the 8 Mile Road overpass retaining wall in preparation for Flex Route 23. Where are Flex Routes needed? Flex Route technology will be considered for highways that frequently experience traffic congestion during peak travel periods. Why not just add another lane? A 24-hour fix simply is not necessary on corridors that typically experience traffic slowdowns only during regular peak travel periods. It is more cost-effective to adapt the shoulder for use as a temporary third lane than it would be to install a third lane. Employing Flex Route technology enables to achieve more capacity out of the existing infrastructure for less money. How does a Flex Route save money? Implementing a Flex Route requires less capital than adding another lane – primarily because it works within the existing infrastructure and doesn’t require the same degree of expansion to implement. For more details, view the Flex Route 23 brochure. newsletter for the dissemination of project information.